What is art, and why do humans make it? The questions sit at the core of a new photographic series by Matthew Rolston, “Art People: The Pageant Portraits,” on view through Feb. 23 at Ralph Pucci L.A.
Rolston, who made a name for himself in the 1980s celebrity magazine scene alongside photographers like Herb Ritts and Annie Leibovitz, worked tirelessly to gain access to the annual Laguna Beach arts festival called Pageant of the Masters, which features volunteer performers in elaborate body paint and makeup re-creating scenes from famous works of art by Leonardo da Vinci, Henri Matisse, Diego Rivera and more. Rolston first attended the event at age 6, and he credits it with jump-starting his fascination with the power of imagery. He began photographing the pageant in 2015 for the Wall Street Journal and later took intimate backstage portraits of the performers to better examine the truth within the artifice. “My intention with all three of the fine art projects that I have created so far is to author an image that will entice the viewer — draw them in — and once I have their attention, to use that platform to raise questions that mean something to me about the nature of humanity and what it means to be human,” Rolston wrote in an email from Berlin. To further bend the boundaries among painting, photography and performance, Rolston used an extremely high-resolution camera system that helped to make the painted surfaces of the subjects resemble actual paintings. In his latest body of work, photographer Matthew Rolston continues his investigations into the nature of portraiture and, more generally, the practice of artmaking in contemporary society. His specific subject is the Pageant of the Masters, a wildly popular presentation of tableaux vivants re-creating famous artworks, which unfolds each year during the Festival of Arts in Laguna Beach, California. Through his incisive lens, Rolston focuses on the dramatis personae—men and women of diverse social and professional backgrounds—who don extraordinarily elaborate costumes and makeup to bring the pictures to life. “I have vivid memories of seeing the pageant as a child,” Rolston recalls. “The theatrics and spectacle had a profound influence on me.” That influence should come as no surprise to anyone familiar with the photographer’s oeuvre—from his dazzling fashion images to his recent ventriloquist grotesques. Rolston has assembled the pictures in an exhibition entitled "Art People: The Pageant Portraits," currently on view at the Ralph Pucci Los Angeles showroom through February 28, 2018. The visceral quality of the performers’ transformation is amplified by the heroic scale of the photographer’s ravishing prints, some of which measure nine by four feet. “I wanted to evoke the sense of wonder that gripped me when I was a kid,” Rolston explains. The title of the exhibition, "Art People," also slyly hints at a subject beyond mere documentation. Rolston seems to be posing a provocative question. What makes a person an art person? A fascination with historical classics or a ticket to Art Basel? Perhaps both, perhaps neither. But it’s a question well worth asking, particularly when the inquiry results in artwork as seriously seductive as Rolston’s. When Matthew Rolston was growing up in LA's Hancock Park neighborhood he was a self-described "art school kid" who took painting and drawing classes at the Chouinard Art Institute and Art Center College of Design, where he later studied photography for two years before being discovered by Andy Warhol. His late brother Dean Rolston was the co-owner of the pioneering 56 Bleecker Gallery, and during school breaks Matthew flew to New York, slept on his brother's couch, and picked up the slack of Warhol's Studio 54 entourage. When Interview needed someone to shoot Steven Spielberg, Rolston got the assignment and Warhol became his first client. In the ensuing years, Rolston went on to shoot Michael Jackson's first cover for Interview magazine, and was soon enlisted by Jann Wenner to shoot U2's first Rolling Stone cover—eventually racking up more than a hundred of them over three decades. With a knack for theatrical lighting and teasing out unique color harmonies, Rolston became one of the most in-demand magazine photographers and music video directors (working with Madonna, Beyoncé, Lenny Kravitz, and Marilyn Manson) of the 1980s and ‘90s. "I'm not a theory person, I'm not an intellectual, I'm a visual artist, and after years of being at my clients' beck and call I'm going to take all the money I earned in the first half of my career and spend it in the second half doing exactly what I want to do," says Rolston, who has done just that over the past six years. After reading a 2009 story in The New York Times about the Vent Haven Museum's collection of 700-plus ventriloquist dolls, Rolston was drawn to the projections we place on these simulacra, and embarked on a journey to Fort Mitchell, Kentucky. He shot more than 250 epic color portraits of the dummies, which were later catalogued in his book Talking Heads: The Vent Haven Portraits. His next project, Vanitas, took him to Palermo, Italy, to take portraits of mummies in the catacombs of the Capuchin monastery. Last fall, Rolston met up with his old friend Ralph Pucci, who was looking to show more art in his new gallery in Hollywood. 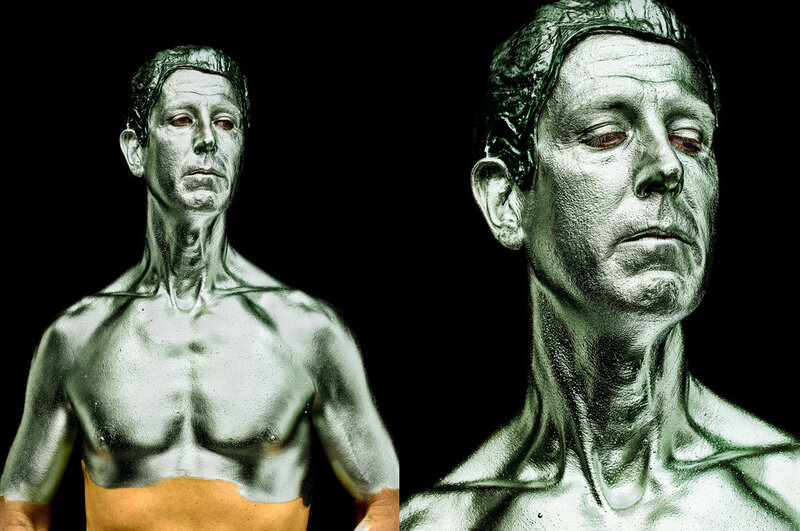 The design dealer was struck by a glowing image of a middle-aged grocery clerk coated from the waist up in silver body paint invoking one of Harriet Whitney Frishmuth's bronze sculptures. Rolston hadn't made any prints from his latest series—in fact, he was busy printing old glamor shots from his new photo tome Hollywood Royale, getting ready for the book's debut and a concurrent exhibition at Camera Work Photogalerie in Berlin. But once the two got to talking, Rolston could see the value in showing these painterly pictures amid Pucci's design gems. As such, Rolston has spent the summer printing 65 images, a total of 22 works—some as large as 90 x 45 inches—for Art People: The Pageant Portraits, which is on view now at Pucci's showroom. For Art People—the title is a reference to the glamorous gallery-going cognoscenti—Rolston revisited his gateway drug into the art world: the Laguna Beach Festival of Arts' Pageant of the Masters. He first visited this volunteer-run, Broadway-level production of art-historical tableaux vivants with his parents when he was six or seven. (In July, the pageant will celebrate its 85th season.) The show's "living pictures" are comprised of ordinary people dressed up as the subjects of famous artworks, which are animated via elaborate sets, makeup, lighting, narration, and orchestral music. "They once did an all-gold Cellini salt cellar that revolved on a dais," recalls Rolston, who returned to the pageant six years ago with some friends and a pair of field binoculars that allowed him to observe the grotesquery behind the players' extravagant makeup. "I realized it was an incredible portrait subject." After explaining how he wanted to shoot the players with a visual language similar to his hero Richard Avedon's In The American West series, Davy cottoned to Rolston's concept but was concerned about such detailed photography of a stage illusion—via heavy make up and papier-mâché costumes—that is meant to be seen from at least fifty feet away. "It's not meant to be seen with all the imperfections, but I told her the imperfection was the poetry of it," explains Rolston, showing me an image of the "golden acne" on the face of a young woman playing Angelica from Antoine-Louis Barye's Roger and Angelica Mounted on the Hippogriff in the entryway across from the silver Frishmuth diptych. "I'm a portraitist, I'm interested in the humanity of the people in those costumes." After a few rounds of negotiations the board acquiesced to Rolston's vision and allowed him, for several weeks last summer, to install a makeshift studio in the company's carpentry workshop, with a massive lighting rig to tease out all the painterly qualities in each costume. There he shot two groups of ten people each night as they came off the theater stage. Many of these portraits, including the images of Weisman, Frishmuth, and the players in Da Vinci's The Last Supper—Rolston's pièce de résistance from the pageant's final tableaux—are being shown as diptychs and multiple groupings against his uncanny images of corresponding dummy templates the makeup artists use to create their magic. As a bonus, he's showing a short film he made of the process behind Davy's gift to him: a cameo as a permed St. Matthew in The Last Supper finale. 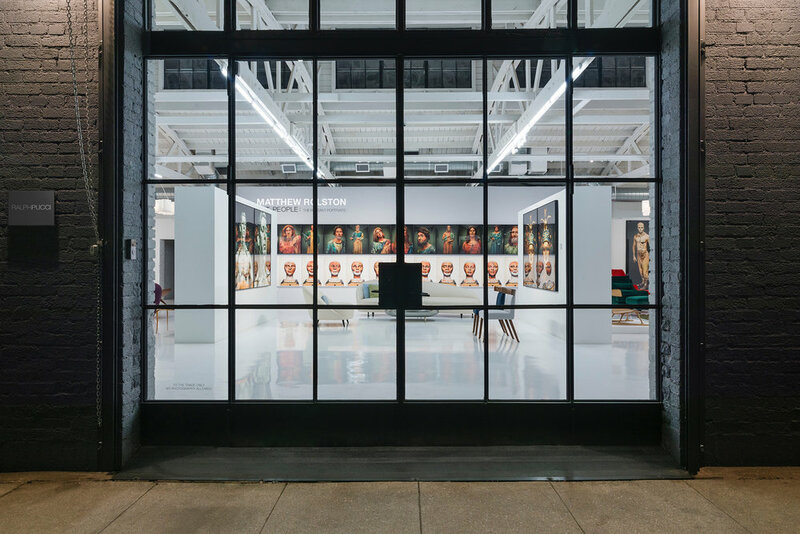 Matthew Rolston opened at Ralph Pucci International, Los Angeles, on October 27. Also on view are new works by Patrick Naggar and Olivier Gagnère. Every summer, dozens of Southern Californians volunteer to be turned into living, breathing works of art. In 2016, a man was painted from head to toe in metallic silver paint to become one half of the frolicsome duo in Harriet Whitney Frishmuth's sculpture The Dancers. A woman in a pastel pink robe and makeup meticulously done to mimic brushstrokes became a character in David Hockney's painting American Collectors. For nearly 85 years, Laguna Beach's Pageant of the Masters has brought to life notable works of art but last year, world-renowned portrait photographer Matthew Rolston was there to document the transformations. The Pageant's tableaux vivant are intended to be viewed from a distance of at least 50 feet. But in the series of photos he calls "Art People: The Pageant Portraits," which goes on display at Ralph Pucci gallery beginning Friday, Oct. 27, Rolston takes a closer look at the people who comprise the beating heart of the event. The Pageant portraits represent the third of these personal projects. In this one, he "uses his distinct grasp of photography to trace a densely referential lineage of protagonists, connecting aspects of his own portraiture to the fragile boundaries between reality, artifice, the animate and inanimate," show literature explains. Ultimately, no matter how it's expressed, this project and his others (as well as his magazine work) are all part of a single obsession. "I’m fascinated by faces and humans," Rolston says. "They're the greatest subject in the entire world of art and have been for centuries." Breathtaking photography is nothing new to Matthew Rolston. You could blindfold the man, hand him an old-school Instamatic, point him at the blandest of subjects, and he could still shoot something that would make you weep with joy over the promise of mankind. But the latest exhibit by the world-renowned artist extends the awe factor to a new dimension. In Art People: The Pageant Portraits, which is open to the public’s gaze through Feb. 23 at the Ralph Pucci LA showroom, Rolston applies his uber keen instincts in a meta purpose: the subjects were all participants in this summer’s Pageant of the Masters in Laguna Beach, where they reenacted great works of art through history with living, breathing humans in astonishing makeup, and then Rolston photographed them. From work of art (painting) to work of art (living poses at the pageant) to work of art (photography), Rolston was captivated by why ordinary individuals— supermarket checkers, teachers, local business owners— would want to participate in the pageant. Heck, Rolston himself appeared in the event’s touchstone presentation, “The Last Supper,” so he must know. Rolston’s work has appeared in W, Vogue, GQ, Esquire and just about every publication that puts a premium on beauty and glamour, and he has also directed scads of videos and commercials. But rarely has his eye loomed larger than it does from the massive frames currently hanging in the Pucci showroom. What becomes a legend most? Don’t miss it. Each year in Laguna Beach, California, participants in the “Pageant of the Masters” arts festival are costumed to look like key figures from famous works of art and take the stage to enact those masterpieces. It’s a slightly surreal event that draws crowds from around the world, as well as Southern California locals who make the much-cherished fest a family tradition. Matthew Rolston is among the Californians who grew up attending the “Pageant of the Masters,” and it not only made a powerful impression on him in his childhood—it also inspired his latest fine-art photo series, “Art People: The Pageant Portraits.” And last night, the project made its public debut in a private event at the Los Angeles showroom of Ralph Pucci International, a company that is legendary for its luxury furniture, lighting, and avant-garde mannequins. “The Pageant is best known for its famed tableaux vivants presentations of art masterpieces, which Rolston began documenting on editorial assignment for The Wall Street Journal in 2015. Rolston gained privileged access to the pageant’s performers, spending several weeks photographing them in a makeshift studio set up backstage during the run of the show,” explains the press release. 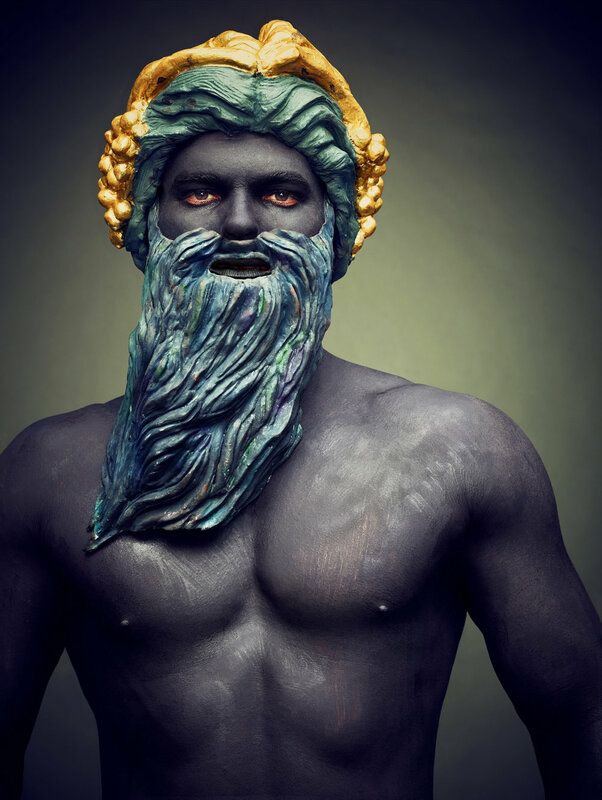 “In their Pageant costumes and makeup, dressed as figures taken from works by Da Vinci, Fragonard, Frishmuth, Matisse, Rivera, Hockney, and many more, these performers posed for their portraits away from the painted sets and theatrical lighting of the Pageant, drawing attention to their unique human characteristics. “Art People: The Pageant Portraits” will be the subject of a documentary film, and Rolston has expressed interest in a monograph should the right publisher come along. This short-form behind-the-scenes film documents Matthew Rolston's personal journey through the creation of the series "Art People: The Pageant Portraits" during Pageant of the Masters, a tableau vivant show of living pictures that has taken place in Laguna Beach, California, for more than 80 years.